Successfully Added 10MP HD Camcorder with Mini Projector (Ordro HDV-D350S) to your Shopping Cart. Introducing the world’s first HD camcorder with removable mini projector, the Ordro HDV-D350S. The real highlight of this HD camcorder is the dynamic 10MP (megapixel) image sensor. This is what powers the HDV-D350S to create breathtaking HD footage that captures even the finest details. Details like individual hair strands or complex water reflections are all recorded beautifully each and every time. The color reproduction is amazing too- so much so that you will sometimes feel as if you are really there! Thanks to the Ordro’s powerful 10MP image sensor you can even use the HDV-D350S as your primary digital picture camera. The extremely vivid and colorful images reach a maximum resolution of 4000x3000, which is pretty impressive for a picture camera- and even more impressive coming from a camcorder. The HDV-D350S comes with 10x optical zoom so you can capture subjects in perfect clarity from far away-- such as small birds in a tree or people hiking to the top of a mountain. The optical zoom does NOT degrade the image quality either like digital zoom will do. So don’t be fooled by large digital zoom numbers, in the real world optical zoom is what really matters. 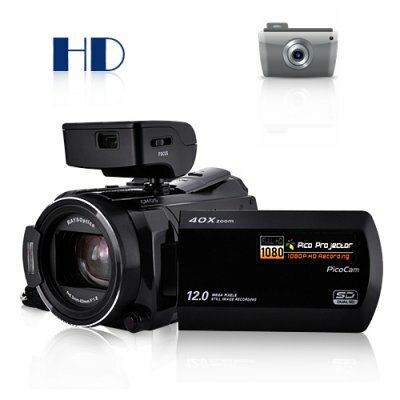 This powerful HD camcorder comes with all of today’s must have features. Highlights include: two SD card slots for storing hours of HD video or thousands of photos, an HDMI connector for connecting to your HDTV, built in flash, A/V and component OUT connections and adjustable image settings for getting the perfect image every time. With the Ordro HDV-D350S you get the equivalent of a $500 HD camcorder, a $175 mini projector, and a $300 dollar picture camera- that’s almost a $1000 value, all for less than $500. Actually, our price is about $100 cheaper than anywhere else online. That’s because this product is straight from the factory without the expensive Ordro branding. And unlike 90% of the websites selling the HDV-D350S, we actually offer a full 12 months warranty and have it in stock in our warehouse right now. NOTE: Due to high demand the first stock of the HDV-D350S is expected to go quickly. Get your orders in now while this product is still in stock and we’ll ship out your order within 24 hours. When using the WVGA setting you can achieve 59FPS videos. Easily view your HD videos on your HDTV by using the included HDMI cable. This is the best way to proudly display FULL HD video for your friends and family to enjoy! This is the direct from the factory OEM version of the famous Ordro HDV-D350S HD camcorder projector. It is the same exact product but without the name “Ordro” printed on it. This means you will save about $100 over the Ordro since we don’t pay for branding or middle men. Can I use this the projector and record function at the same time? Yes, the unit can record and project at the same time. Can I connect an external microphone or light to this device using the adapter on the top? No, the adapter is for use with the mini projector only. Yes, with the DV46 you can easily create videos for use with YouTube.